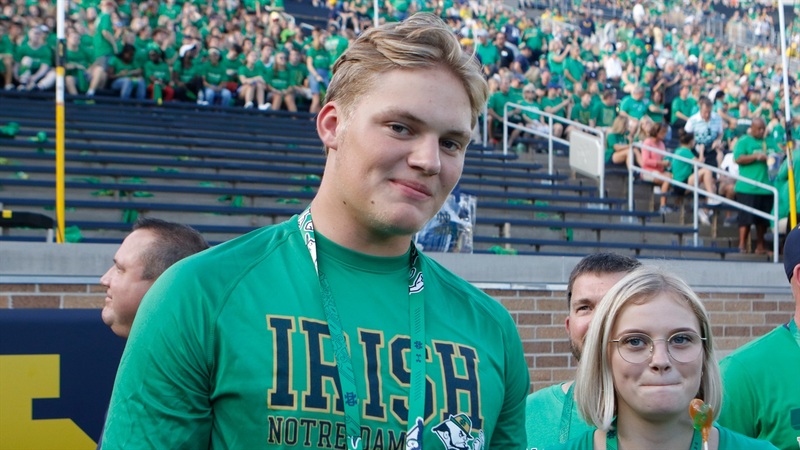 2020 Port Huron Northern (Mich.) defensive end Braiden McGregor‍ made his long-awaited return to South Bend this weekend for an official visit. The four-star prospect is no stranger to Notre Dame, but the 6-foot-5, 250-pounder had some questions he wanted to be answered and to hang out with the members of the team to get a better feeling for the program. McGregor spent a lot of time around fellow 2020 defensive linemen Aidan Keanaaina‍ and Rylie Mills‍ during his visit. The three hit it off immediately and it led to a fantastic weekend for all involved. “I spent a lot of time with Rylie and Aidan about 99 percent of the time,” laughed McGregor. “It was pretty funny because everyone was like ‘Oh, there are those three again.’ We just did everything together. We all clicked. It wasn’t like they made us click. It really just happened. Walking in and seeing each other, we just clicked and sat down at dinner. The Port Huron Northern star also had another chance to see defensive line coach Mike Elston in action on Saturday morning. McGregor was able to get a close look how Elston’s group goes to work and learn more about his coaching style. “I love the way Coach Elston coaches,” stated McGregor. “He’s going to be hard on you when you mess up and love on you when you do great. He genuinely cares about you. Some of the stories the guys told me about what Coach Elston did for them when they were freshmen were cool to here. On Saturday night, the official visitors headed up to Brian Kelly’s lake house for the evening and McGregor was able to get an authentic feel for the staff and the players in a relaxed environment. “It was awesome,” said McGregor. “I was only there for about an hour, but just being around the people was great. The people are a huge thing for me. Coach Kelly sat down with us for a little bit along with Coach Elston and Coach (Clark) Lea. Coach (Brian) Polian came over too. They all came over and made sure we felt welcome. During the time McGregor was at Kelly’s lake house, 2020 receiver Jordan Johnson‍ committed to Notre Dame and it not only surprised McGregor but everyone there. With Johnson committing, did McGregor think about pulling the trigger during his visit? McGregor will now look to finalize his other official visits and while it’s unlikely he gets back to South Bend before he makes a commitment, he left a small crack in the door. “I think that was it,” said McGregor. “I’m not totally sure, so it depends on how the next visits go. I could need to get back to Notre Dame one more time to make sure or get to Alabama, Clemson, Florida or Michigan. You never know.